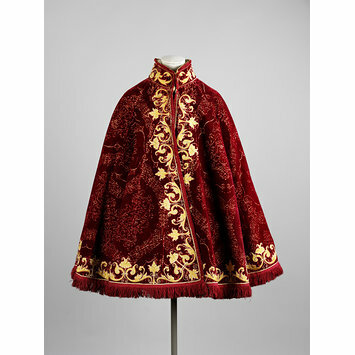 A cloak was an essential component of the fashionable ensemble for a 16th-century gentleman. While most were intended as protection against the weather, those made of expensive fabrics such as silk, and richly decorated, were primarily symbols of wealth and social status. 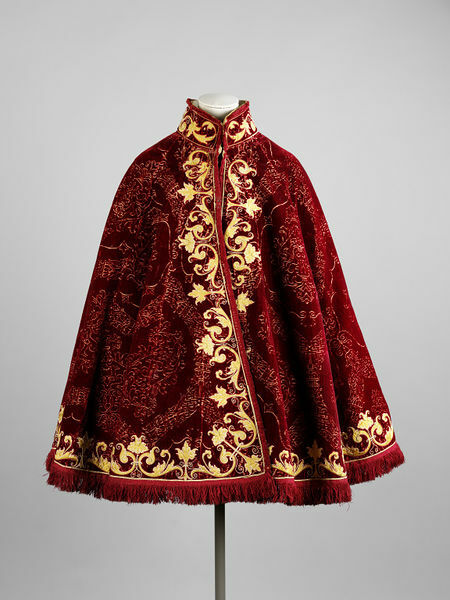 Usually worn over the right shoulder, a fine cloak allowed a young ‘gallant’ a dramatic flourish when entering or departing a room. This example is made of Italian silk with a red pile in a palmate pattern on a voided cream satin ground. It was probably crafted from another garment, possibly a petticoat. The collar, front and hem of the cloak have been decorated with applied yellow satin outlined with silk cords, in a scrolling design of stylised foliage.